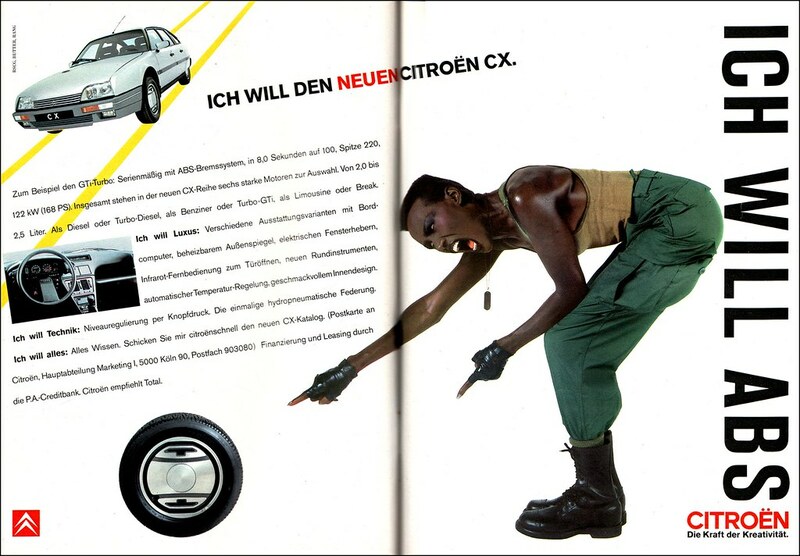 Grace Jones and the Citroen CX; two entities with a lot in common. Both idiosyncratic, misunderstood and just plain weird to some, but entities that were on a wavelength only the truly enlightened could fully comprehend. 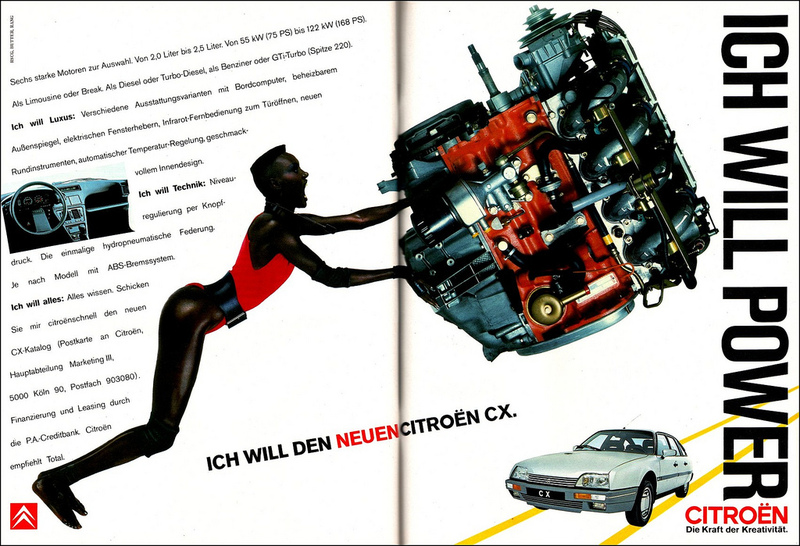 We've always been a fan of both, so when Citroen used Jones in their 1986 advert for the series II Citroen CX, it was a perfect fit to our eyes. 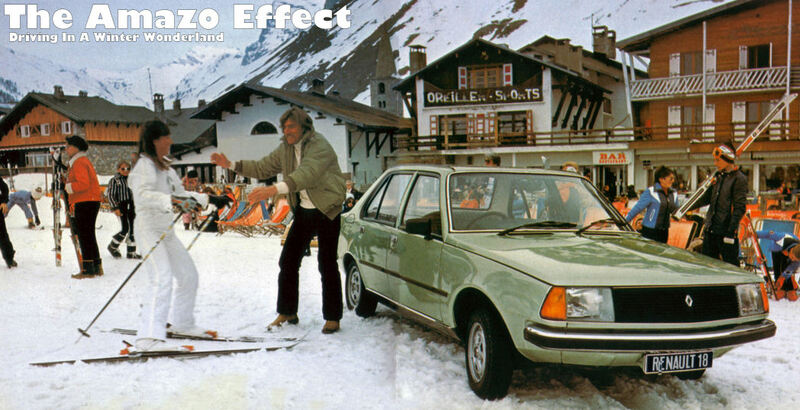 The Citroen CX was arguably the last 'true' Citroen; launched in 1974 before the company went bankrupt (a story in itself), which resulted in the Peugeot takeover. The CX took on the massive task of replacing the truly iconic DS and found sales beyond the normal Citroen buyer. 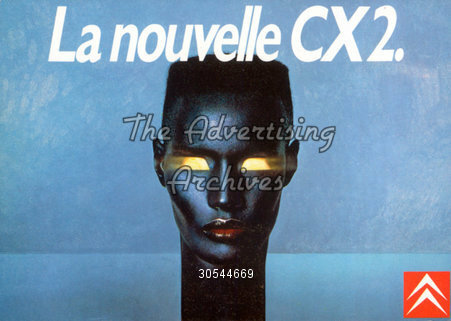 The 1986 series II CX was a little more conventional than the series I and lost some of their earlier distinctiveness as a result; gone were the wonderful rotating drum instruments reminiscent of 70's sci-fi, replaced with more down to earth conventional dials, the radio migrated to the new dashboard from it's previous incumbency between the front seats, the stainless steel bumpers were replaced by ABS plastic items and the door mirrors replaced with items that eventually lived way beyond the lifespan of the CX on cars such as the TVR Griffith and 4th generation Lotus Esprit. 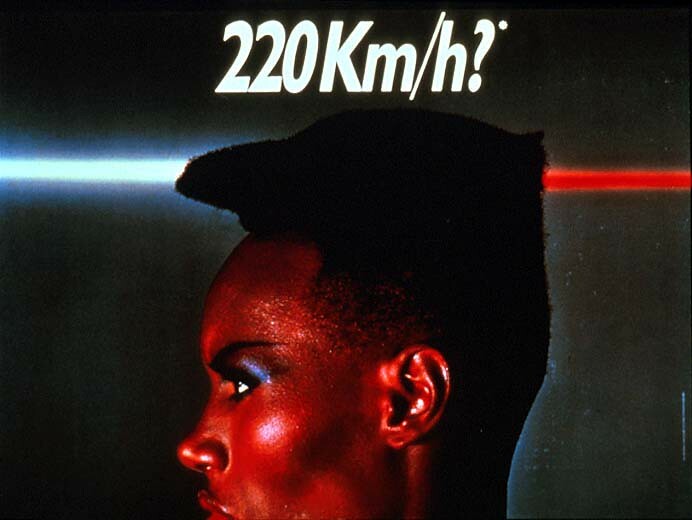 The advert was directed by Jean-Paul Goude, who also did Grace Jones' music videos at the time (footage from the ad was used in the Slave To The Rhythm video). 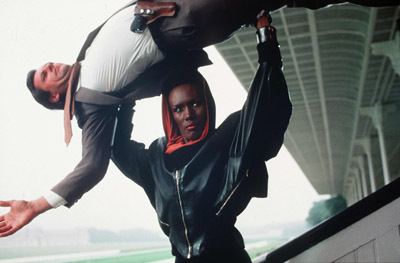 The idea of Jones being in the advert was probably a no-brainer, seeing she and Goude were an item at the time. 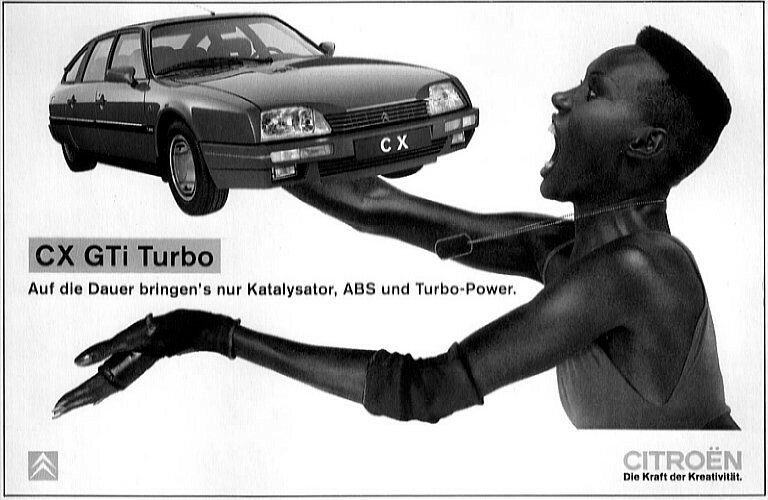 The concept is pretty simple and totally normal and realistic: Grace Jones, at the time fresh out of James Bond and riding high in the charts with her songs, is seen driving the CX atfer a giant replica of her head spits it out. That’s precious. Amongst other things, Goude did a Chanel Coco advert in 1991, with Vanessa Paradis (paramour of Johnny Depp) as a bird in a cage. Lucky git. If the name means nothing to you, you're probably under the age of 35. Go ahead and Google Vanessa Paradis, we'll wait. See what we mean? Lucky git. 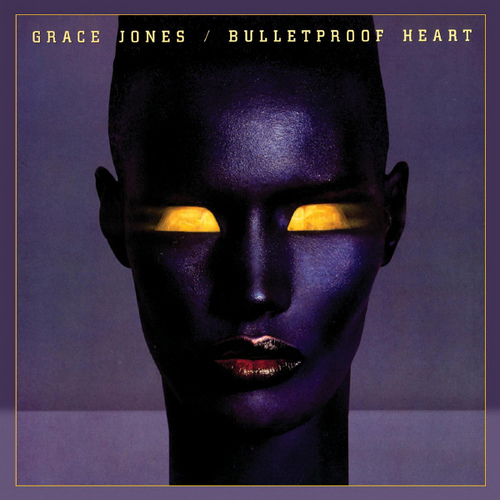 "Careful where you put that engine, don't drop it - too late..."
The imagery of Jones from the advert was also used for her 1989 album Bulletproof Heart. This was Jones' last studio album for 19 years, until she released Hurricane in 2008. 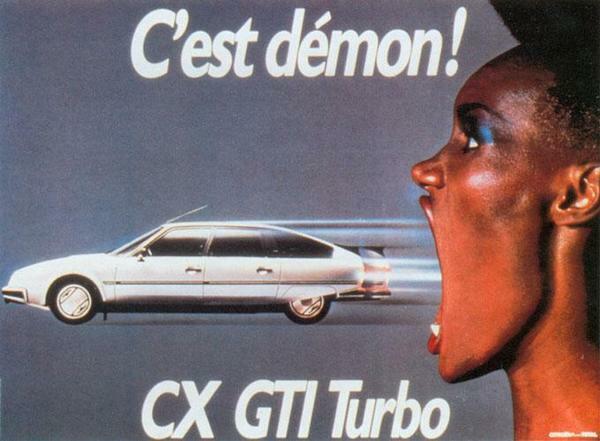 "I'm peckish, bring me a CX"
Labels: Citroen CX, Grace Jones, Grace Jones Citroen advert.